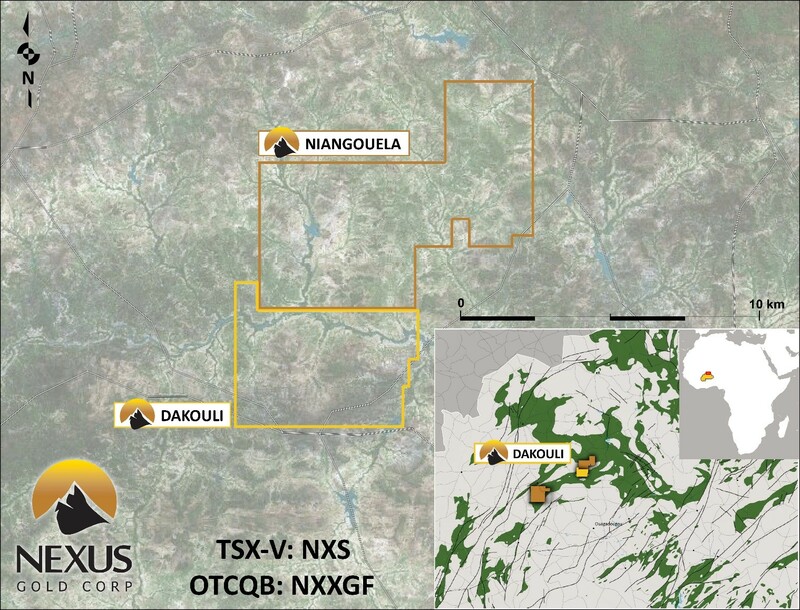 VANCOUVER, CA / ACCESSWIRE / November 9, 2018 /Nexus Gold Corp. (''Nexus'' or the ''Company'') (TSX-V: NXS, OTCQB: NXXGF, FSE: N6E) is pleased to report that its wholly owned subsidiary, Nexus Gold Corp. Burkina SARL, has acquired the Dakouli 2 gold concession, a 198-square kilometer gold exploration permit located in central Burkina Faso, approximately 100 kilometers due north of the capital city Ouagadougou. 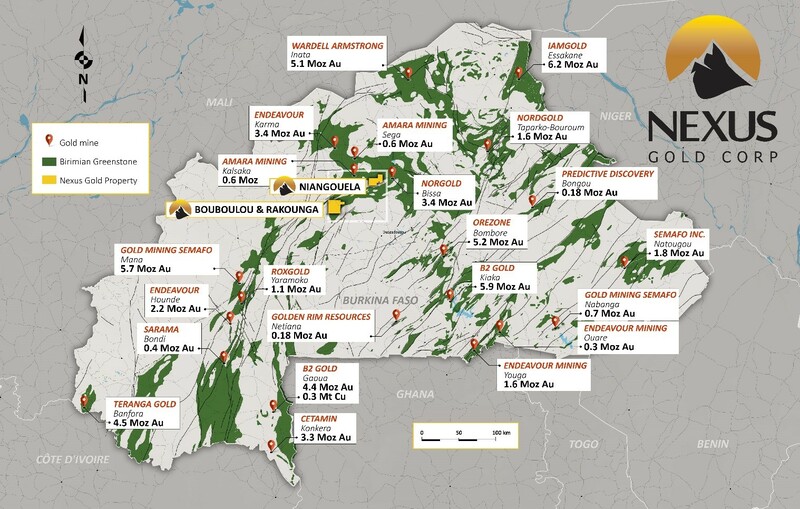 The 198-square kilometer property lies immediately south of the Company's 178-sq km Niangouela concession (see figure 1) which has been explored over the past two years. Sampling at Niangouela returned bonanza-grade gold values, including 2,950 grams-per-tonne (''g/t'') gold (''Au''), 403 g/t Au, and 49.8 g/t Au (see Company news releases dated January 11 and 24, 2017). The maiden drill program at Niangouela returned significant high-grade intercepts, including 26.69 g/t Au over 4.85m, including 1m of 132 g/t Au (see Company news release dated March 7, 2017). ''Dakouli is a promising addition to our portfolio,'' said Alex Klenman, President & CEO. '' Our crew knows the area well as our Niangouela project is adjacent directly to the north of Dakouli and has provided some high-grade results in the past. We feel Dakouli may also present some higher-grade opportunities. The property contains some highly developed artisanal sites, which we believe is indicative of significant mineralization. We are immediately going to start testing these zones and get a good idea of what we're dealing with,'' continued Mr. Klenman. 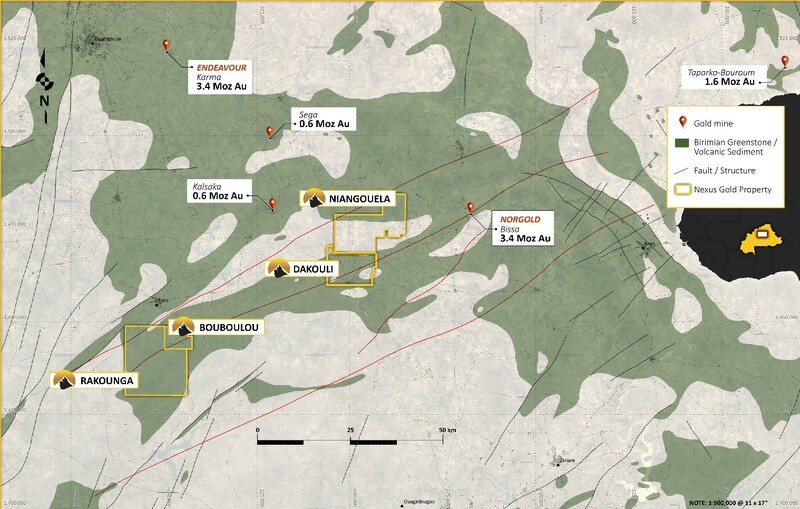 Rakounga- The 250-square km Rakounga gold concession is adjacent to and extends the Bouboulou gold trends and currently contains three drill-tested zones of gold mineralization. Over 15-kms of gold trend has been established between the eight known Bouboulou and Rakounga gold zones. Drilling at the Koaltenga zone has produced some lengthy gold intercepts, with several higher-grade intervals. © 2018 Accesswire. All Rights Reserved.